GALION — A late morning fire on Neumann Avenue on the city’s north side destroyed a detached garage and caused a little damage to the property owner’s home and a nearby garage. Galion firefighters responded to 330 Neumann Avenue, off Fairview Avenue, about 11:40 a.m. and found the two-stall garage ablaze. The homeowner is Mark Hinklin. There was some heat damage to Hinklin’s home and to a garage at 328 Neumann Ave., Moneysmith said. Firefighters were on the scene for about 90 minutes, and the fire did not present any odd problems. No one was injured, neither the homeowner nor firefighters. 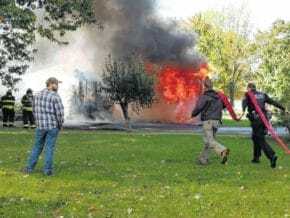 Galion’s fire department responded with the four firefighters on duty and called in three additional firefighters for assistance, but did not call any other departments for assistance. The cause of the fire is undetermined and a damage estimate was not readily available. Email Galion Inquirer editor Russ Kent with comments or story ideas at rkent@civitasmedia.com.